While technically the renovation of this room was finished last May, it took us quite a while to make the room feel complete. Honestly, it's still a bit of a work in progress, but I suspect it will continue to evolve for a while as we figure out what is working and what, if any, changes we might need to make. The biggest change we made was having the mantle of the fireplace removed. While I liked it well enough, it was very high - if I think back correctly, it was almost over my head, so that meant it was probably five feet off the ground. All fine and good for displaying proportionally-sized items, but not-so-fine if we wanted to mount a TV on that wall, which we were wanting to do. We'd returned from North Carolina after Christmas with a nicer flat-screen TV than what we owned (we love that our techie kadults give us their cast-offs when they upgrade), and it was too wide to fit in our current entertainment wall set-up. Plus, we were wanting to reorient the seating in that room so we didn't always have to have our backs to the large window - after all, one of the big reasons we bought the house was the backyard and all of the trees and greenery, and it always felt dumb to not be seeing it while we were in that room. Along with removing the mantle, we had an electrical outlet and HDMI port wired on that wall so that the cords would be hidden once we mounted the TV. 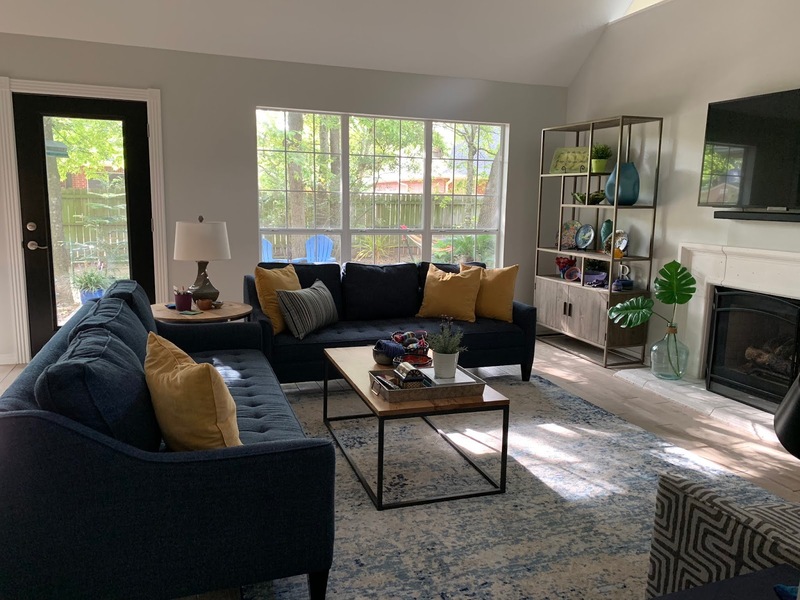 We got new flooring, which was wonderful as we'd been living with painted concrete and a large throw rug for 10 years, we had the walls repainted, and we got a new, more modern-looking ceiling fan. Oh and we changed the back door from with a French-door aesthetic to a more modern look with the single pane of glass, and of course, the black-painted frame that was a last-minute decision that we ended up loving. 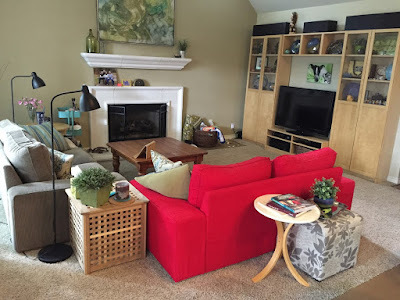 This was the most recent furniture arrangement - the red loveseat was inherited from Sam, which is why it didn't match the taupe loveseat that we'd bought years later. 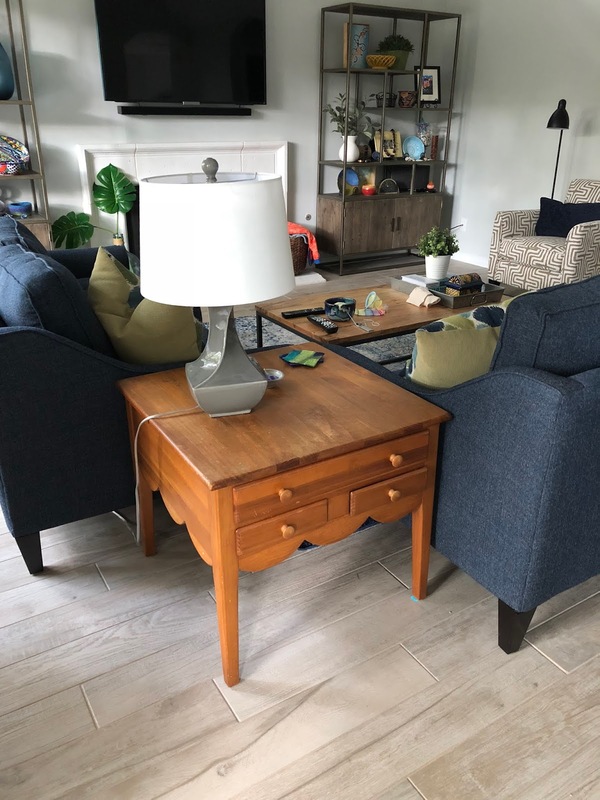 The square coffee table was our old Ethan Allen pine one that we'd bought in the early 90s and it had served our family well - it made a great table for puzzles, Legos, and Hot Wheels, and it was still in good shape, albeit with a few battle scars. Most of the rest of the furniture was from IKEA, including the wall display/entertainment system. New furniture, (mostly) new layout - the room seems so much bigger! Another prior arrangement - while we didn't notice it at the time, the room looks very unbalanced here, doesn't it? Now that you can see the layout, let's talk furniture...because yes, we ended up buying all new furniture! This was a planned-for expense with our renovation budget - we really wanted to get the room done because except for that one time in the early 90s when we had money to buy a roomful of furniture, we've never been in that position again, and as a result we've always felt like we never quite pulled a room together. We chose the sofas first - well, these were our second choice, actually. Our first want was an L-shaped sofa/chaise piece, which we really liked and visited several times at the furniture store to be sure. 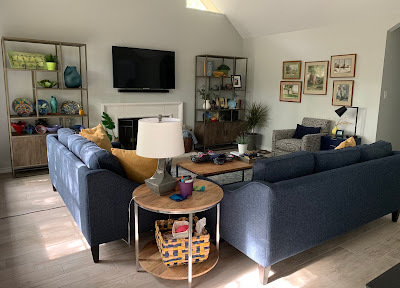 Once the new flooring was complete in this room, we were ready to order the sofa, but at the suggestion of my mother, we took some butcher paper and taped together the exact size of the sofa/chaise to make sure it would fit in the room. Guess what? It was too big. I mean, it would have fit, but it would have interfered with the opening to the hallway, or it would have been too close to the fireplace, or, well, you get the picture. I'm so glad we listened to her (see kids, always listen to your mother), because it would have been a disappointing, costly mistake to live with otherwise. We really liked the style of the sofa/chaise, so we ended up choosing that same style, but in sofa form. 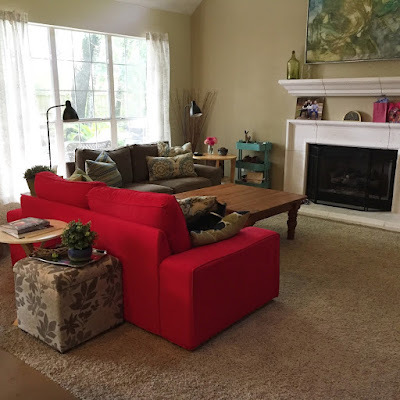 I think traditionally you might choose a sofa and a loveseat, but we both wanted to be able to stretch out on them, and the room could fit that size, so we decided on two sofas. We were just about to order them and had the color - a really nice charcoal gray - picked out, when our salesman suggested we take a fabric sample home to make sure it would work. We humored him by doing that...and again, it was a good thing we listened to him because we hated the color in that room - it was way too dark. Another trip to the furniture store, a few more fabric samples taken home, and we decided to go with a navy tweed, which we really love. I will say that having a white dog makes me have to vacuum them more often than I'd like, but that's life with pets. Before we'd ordered the sofas, we stumbled across the West Elm outlet in San Marcos, which is about a three hour drive from our town - we happened to be near it when we went away to Gruene for the weekend in May, and stopped in on our drive home. We loved a coffee table and an end table, so I applied for a West Elm credit card mainly to get the rewards from making these purchases, and we came home with a car jammed with furniture! The top is acacia wood - we liked the different color tones within the piece. The frame is metal and it goes with the lighter, more airy feel we were looking for with the room. The shelving units on either side of the fireplace were a fun find - at first I talked with our kitchen cabinet guy about building custom units, and he was enthusiastic about doing it, but he was incredibly busy with his kitchen orders and I got the feeling that we'd be waiting a long time to get them, so we started looking at furniture stores. We weren't having much luck in finding anything we really liked, much less anything we wanted to pay for - especially knowing that we needed to buy two of whatever we found. One Saturday afternoon I googled "best furniture stores in Houston" and we went off on a spontaneous drive. We landed at an interesting-sounding store called Nadeau and found the two units you see here. They were much more budget-friendly, plus we loved that we could have hidden storage in the cabinets for all the TV gear. At Nadeau, if you like something you should buy it because they don't have distribution centers - each store gets different items, most of it is one-of-a-kind, and when it's gone, it's gone. Only one problem: they don't deliver. We purchased the two units and drove home, figuring we could rent a truck and drive back the next day to get them, but just on the off chance that they were available, we texted Jimmy and Karen, who have a pickup truck, and they were up for an adventure, so the next morning we drove to their house, got in their truck, and went to Houston! We stopped for lunch at a Mexican restaurant along the way, and when we got to Nadeau, both Jimmy and Karen found some items for their house, so it was a fun time all around. 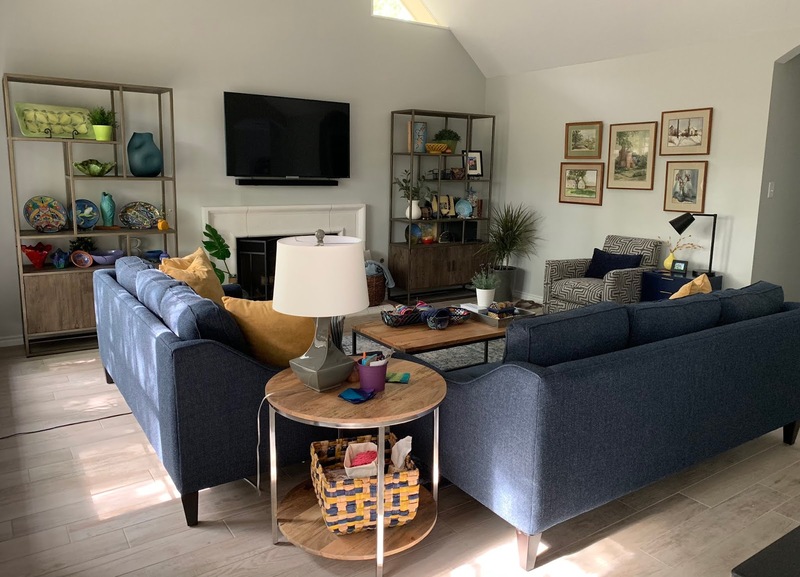 Plus we just enjoy spending time with them, and I like Karen's decorating style, so it was good to get her take on what we were thinking about doing for the room. I suspect these will always be a work in progress, because I'm constantly changing things around. The taller holes have been a challenge to fill - I bought the large blue vase using my reward dollars from West Elm and I might get some greenery for it one day, but I already had everything else you see here. 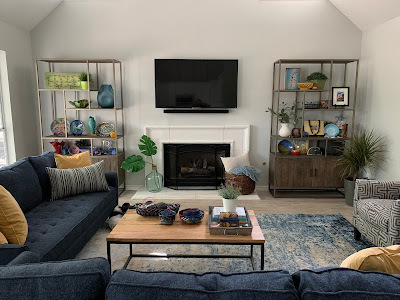 Same goes for this side - the only thing new is the white vase (again, West Elm rewards...that single purchase paid off, LOL) and the greenery inside of it. I had some issues with this chair. We ordered it when we got the couches, and when it came in, the fabric was wrong - the pattern was correct but the coloring was off-white and olive green, not the gray tones I wanted. So they reordered it, and when it came in...I didn't like it. I kept thinking that I probably should have just ordered it in a solid color (I went with a pattern because the two sofas were solid). It didn't help that I couldn't find an end table that looked right with it, so it sat by itself on that wall, with no pictures hanging above it, which I'm sure didn't help to make me like it any better. I think the only person who saw it aside from Jeff and I was Diane, and she could see what I was talking about, so it wasn't just me. A few weeks ago it hit me that maybe I should consider a painted end table instead of the wood/metal combinations that I'd been looking at, and I started focusing on either yellow or navy; I ended up with this little navy unit that made me like the chair more - I think having something solid next to it helped to break up the pattern? I don't know - this is where my lack of design schooling is evident. But it worked enough that I was finally willing to hang up some pictures, and I found a little lamp that pulled it together enough that I'm good with that area. 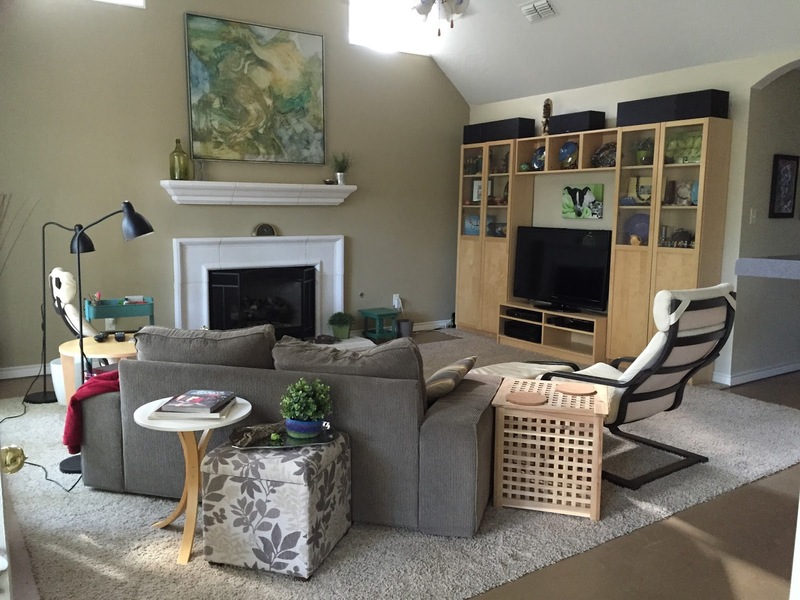 The area rug was yet another challenge - are you sensing a theme with this room? 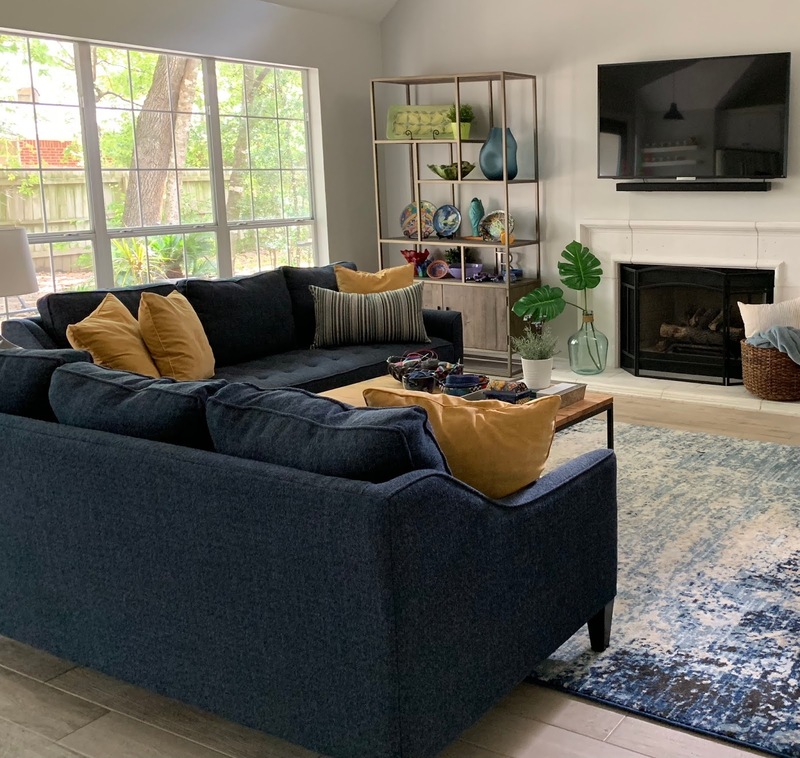 I've never bought a big rug like this, but with the tile flooring, we needed one to reduce the echo, not to mention tie the furniture together. We had to wait until the sofas were here to see what size we needed, and then we started looking at rugs online, which as you might imagine, was pretty overwhelming. 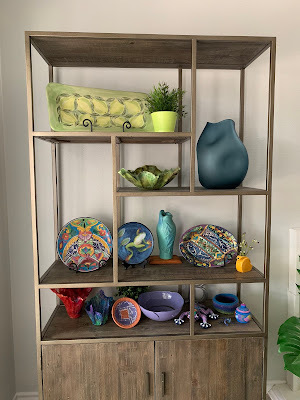 So we went out to look in person at the few furniture stores in town and while we didn't see anything we loved, we did talk with a pretty knowledgeable saleswoman who gave us some guidance on types of patterns that might look good with our furniture. Unfortunately the rugs in her store were in the $2000 range for the size we needed, which was way too much money to spend on something that I know for a fact will be barfed on by Paco and Henry. I found a few rugs that I liked on Wayfair, and decided to give one a try because their shipping was free and return shipping was free as well if you accepted a store credit instead of a refund, which was fine with me because I had several rug possibilities chosen and figured I could just work my way through them if need be. 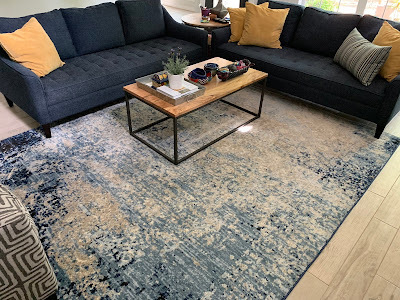 Happily, we ended up really liking the first rug I ordered, so we didn't have to do a return and reorder, but it was nice to know we had that option. The end table for this area was another thing that threw me. 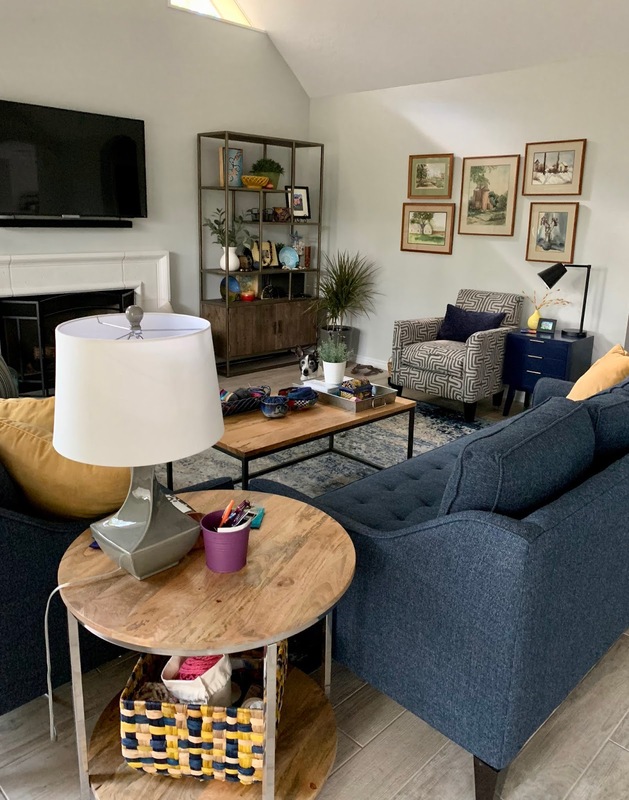 We'd bought one at the West Elm outlet that went with the coffee table, and we loved it - but it ended up looking too small in the corner created by the two sofas. I moved it into our bedroom for my nightstand and I'm happy with it there, but I could not figure out this spot. I put an old square end table there for the time being, and while the larger size was good, it still didn't feel right. I looked and looked for a lighter piece with a metal frame similar to the coffee table, but nothing was feeling right. 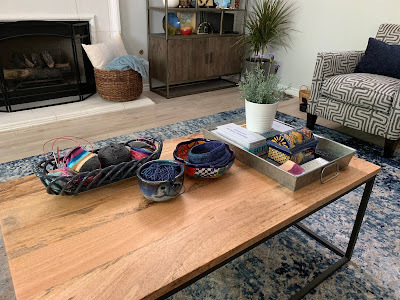 One day I decided I was just going to order something, so I texted Karen a picture of the current set up with the old square table and some links to the potential new tables, and she articulated what I could not see - the square table was too boxy and closed off. (You can also see the chair with the wrong color fabric in this picture). Hot diggity-dog - a large round end table was just the trick! My bonus find was that it also had acacia wood to coordinate with the coffee table. 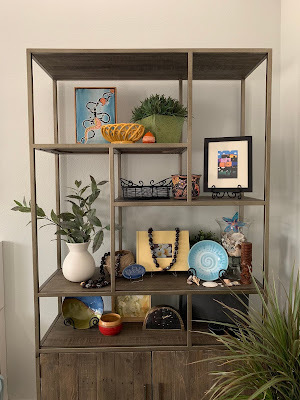 And while I wondered if adding yet another color of metal to the room (the coffee table and wall units are different colors, as are the drawer pulls on the little blue end table, and the new piece had a silver frame), I actually don't notice it. Or maybe I'm just tired of looking, LOL. Any case, I love the round end table and I figure if I ever want to get it all matchy-matchy, I can spray paint everything black. 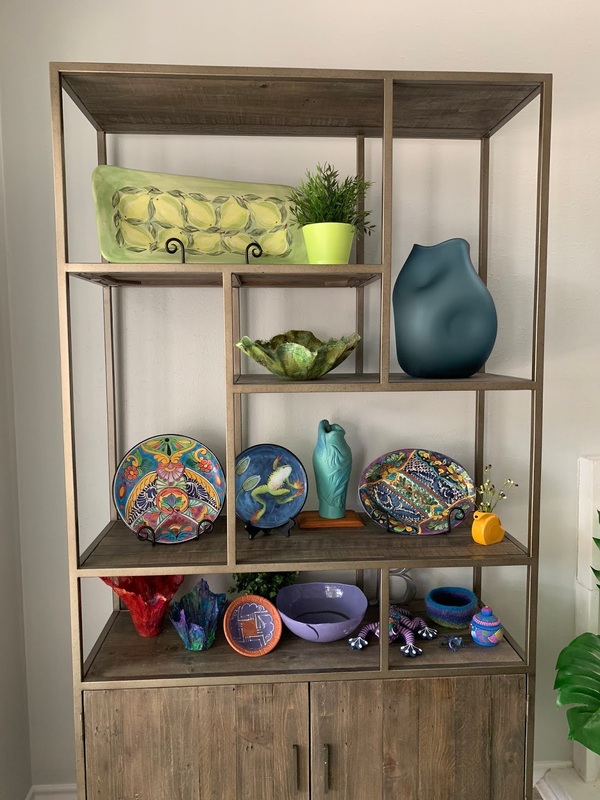 While we spent a lot of money (for us) buying everything for this room, what we bought was not all that expensive and I got a lot of items on sale. 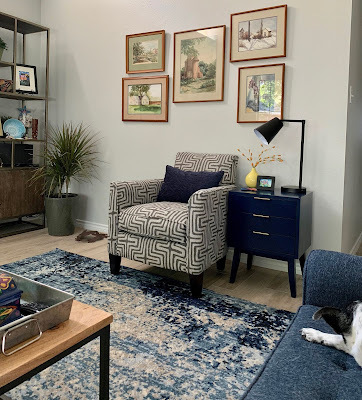 I set aside $5,000 for our total furniture budget and we still had plenty of money remaining to get what we needed for Jeff's office, my office, and our entry way - oh and those ding dang guest room lamps, LOL. I guess it pays to have reasonably inexpensive taste. We really like how the room has turned out and spend a lot of time in it now. And our sofas finally match - woohoo! i keep saying this but can you come to my house, please? Wow. What a transformation and it looks stylish and cozy. Well done! Thank you! I could come to your house but I'll have to stay a while - this room took me months to do. I love this room. These are all "my" colors and, in fact, I've been wanting to paint my bedroom and you've given me some ideas as my comforter and curtains are navy. Seriously, my furniture is not that old but all these renovations posts are making me wish I could throw everything out and get all new stuff lol! Yay for inspiration! It is always so nice to freshen up a room - even paint does so much. Are you sure you didn't go to interior design school? I'm pretty sure you did LOL. I love every single thing in this room! I now have renovation envy, ugh! SO many things I want to change in my house but am hindered by time and budget. Will have to live vicariously through you, lol. Ooh, the post I've been waiting for! I LOVE that rug! It just makes everything sparkle. And I love the way you put containers in certain places, like the basket underneath the round table, and the metal tray on the coffee table. I like those shelving units too. I love the different size display areas, and I agree, its nice to have some place to store things out of sight. I like the chair too! Thanks! 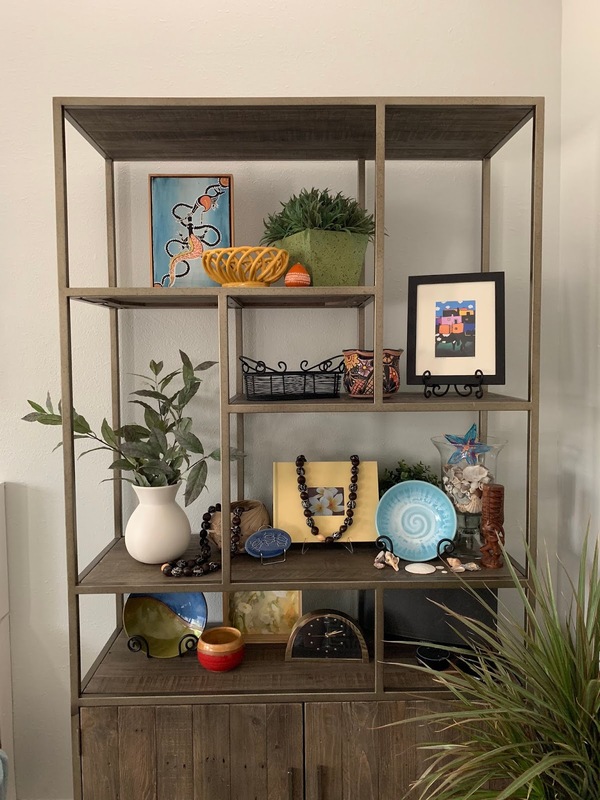 I wanted to make the accessories look nice while being useful - while I love seeing pictures of nicely-staged rooms, I knew that wouldn't last so this was my solution. The rug is really cool; I'm so pleased with it! This looks fantastic and so put together! Great job! I love the rug you picked out and am happy it worked out on first order! And I get what you mean about the solid table next to that chair - it helps! I'm glad you had some help with figuring out the sofa arrangement (thanks mom!) and color (thanks salesman!). I can't believe that high mantle! Definitely a good call to remove it. That store you went to in Houston sounds fun! Do you have The Dump? It's been described to me as being similar. Gina and fam went in Dallas and we just got one here. I love the style of your coffee table. I sent this post to Steven cause that's the style he always shows me. This is the kind of look we want when we can afford to replace everything! I just looked up The Dump - it's in outlying cities to us, but I don't think it's similar. You should tell Gina to check out Nadeau in Dallas - I believe there is one somewhere in that area. It turned out great!!! And under budget is even better!!! !